Dorset Healthcare has teamed up with; Bournemouth & Poole Rough Sleepers Team, Dorset Assertive Homeless Outreach Team, Pivotal Housing, Faithworks Wessex, YMCA, Michael House, Hope Housing, BCHA, Lantern, Providence Surgery, Bournemouth Borough Council, Pilsdon, Salvation Army and Homeless Link to create an in-depth report on the health challenges faced by the homeless locally. 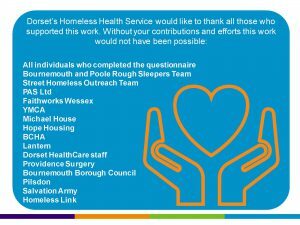 Many Street Support partners, along with others, helped to provide information which enabled them to create ‘the first comprehensive assessment of Dorset’s Homeless Population’. Dorset Healthcare has a dedicated Homeless Health Service, which strives to improve access to healthcare and the quality of services offered to the homeless population throughout the region.